It's time to announce the winner of our first Super Saturday competition to win a Samsung EVO 32GB memory card. The theme was 'Speed'. It's time to announce the winning entry from this week's Super Saturday competition, where the theme was 'Speed'. 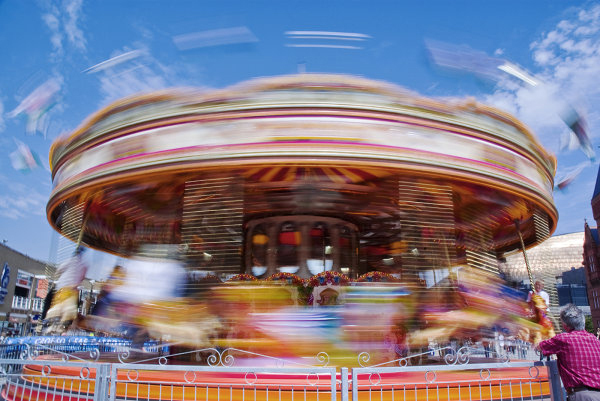 You showed us some fantastic speedy images, and after having a good look through them all, franken's image of a merry-go-round which uses blur to show the speed was crowned the winner. Thanks all for entering, and keep your eye on the site this Saturday for a new theme and a new chance to win a Samsung 32GB EVO Plus memory card! Well done, Ken. Great shot. Received it yesterday and thank you once again.